Holiday traditions, in today’s post. Last Sunday, like every other history geek in Queens, I found myself at Queens Plaza waiting for the MTA’s annual “Holiday Nostalgia Trains” event to start. I missed the first roll through, as I was up fairly late the night before, but got there in time for the second showing. 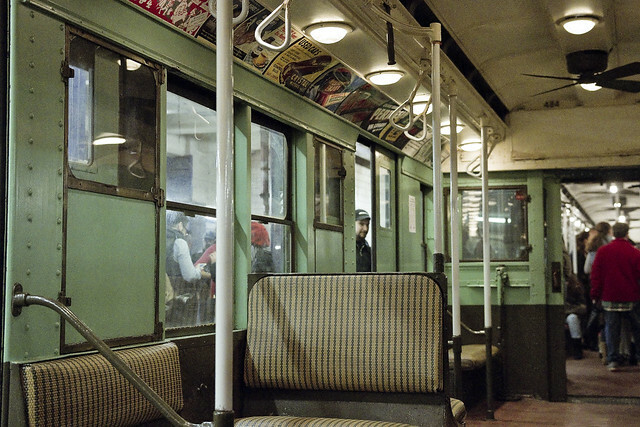 The Nostalgia Trains are late model subway cars maintained by the transit museum that are still quite functional. 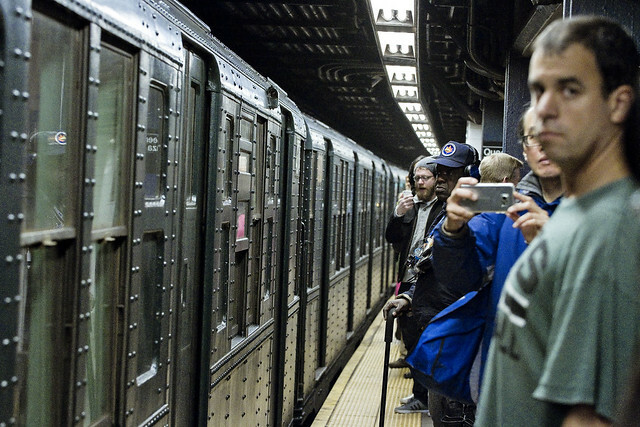 They make a round trip from Queens Plaza to the City’s Second Avenue stop on what’s normally the “F” line. 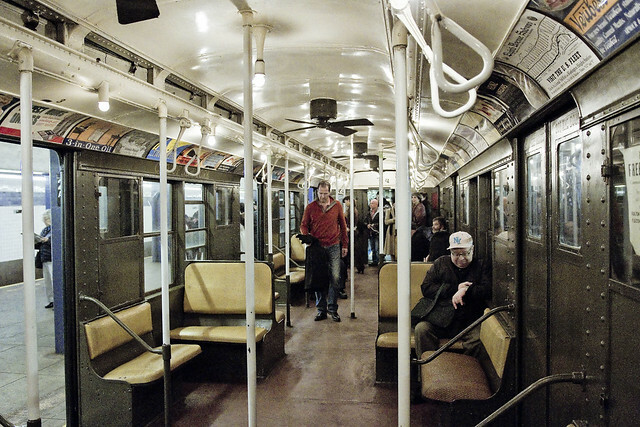 As an aside, my railfan pals can cogently argue that the subway cars which the modern day F is using could qualify as museum pieces, but that’s another story. 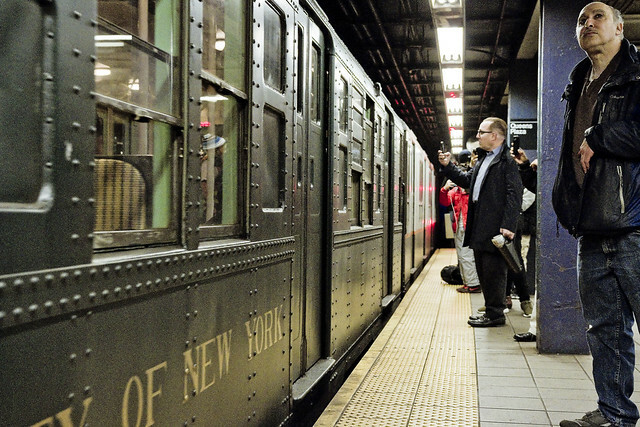 Famously, the Nostalgia Trains run several models of car which would be familiar to New Yorkers of the 1940’s, 50’s, 60’s and so on. Some of these units were online as late as the 1970’s, I’m told. 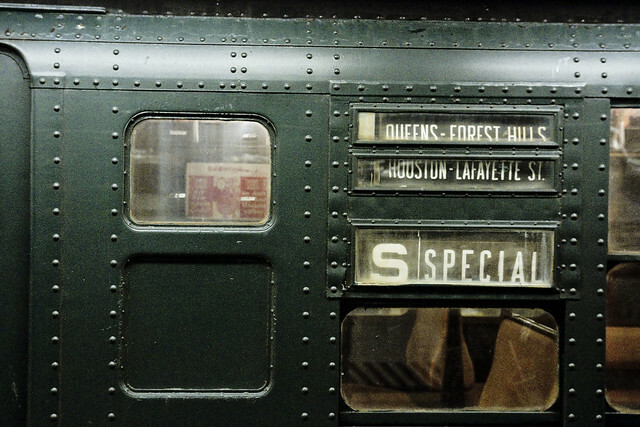 Back in the day (as late as the 1980’s), as it were, the L or Canarsie line had incredibly low ridership by modern standards, so MTA used some of these antiques to service it. One missed last year’s Nostalgia Trains, for a variety of reasons, but after the long holiday weekend – Our Lady of the Pentacle suggested that I get out of the house for a while. 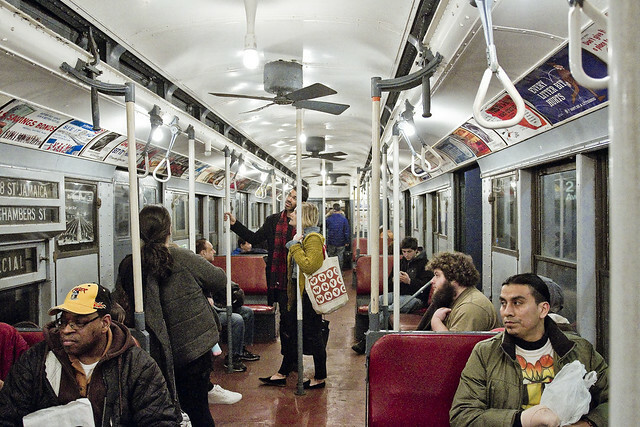 I ran into a number of people I know onboard, and met a few new people – including a Subway Historian named Andrew J. Sparburg. 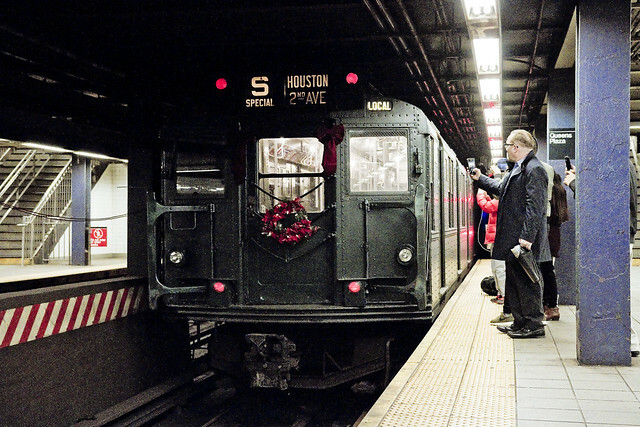 MTA is going to be running the Nostalgia Trains every Sunday during December, and the link below offers a bit of nitty gritty about the eight historic examples of their rolling stock, and a schedule of when and where you can board and ride. Seven of the cars on the “Shoppers Special” are nearly identical except one: No. 1575, which appears much more modern than the rest of the consist. No. 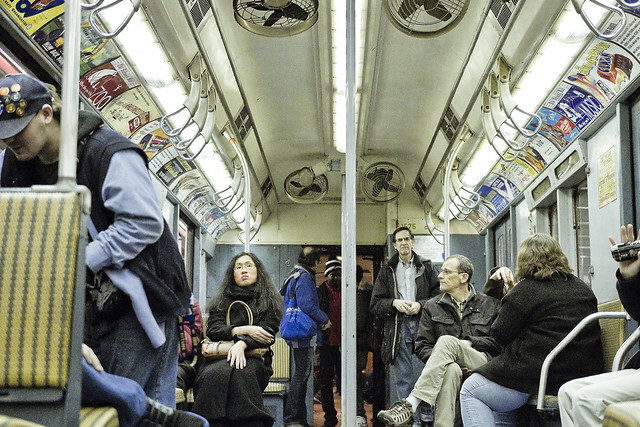 1575 is the prototype for the subway car class that followed the R1/9, with amenities such as fluorescent lights and smaller ceiling fans. 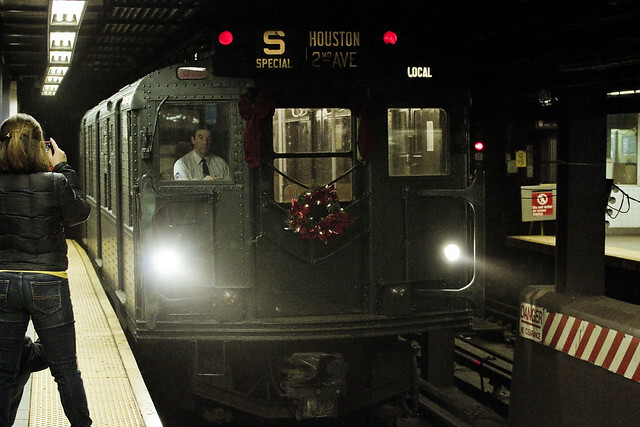 Customers can visit the train year-round at the Transit Museum, though it sometimes makes guest appearances for special occasions such as anniversaries and the holidays. 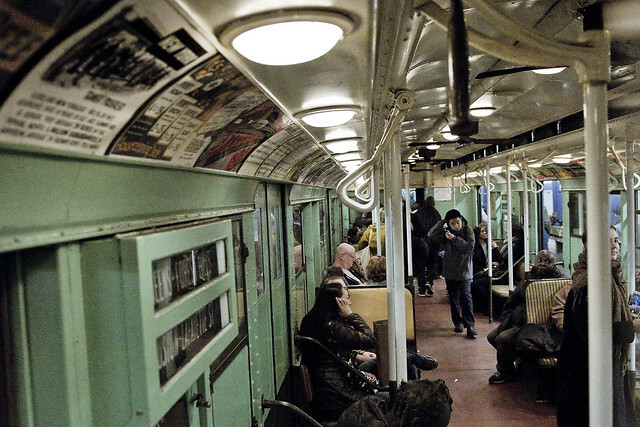 One does wish that MTA had preserved just one of these historic units in the actual distopian condition which distinguished the NYC Subways during the “bad old days.” Graffiti, mess, etc. It would be great if they hired a professional junkie to pass out on the rattan seats as well. Spray some piss scented air freshener around, hire a couple of thugs to menace the crowds, etc. Poop on the windows… y’know – New Yawk, Fun City. The problem with museum pieces is often the loving restoration, which belies what their true operational ambience was. Personally, I was rather happy that all of the shooting which I’ve been doing in the Subways over the last couple of years seems to have finally paid off. Practice, practice. The nostalgia trains carried us from Queens Plaza to Manhattan, where a short interval was suffered and the reverse trip was begun. I spent much of the first half of the journey catching up with friends and acquaintances, then got busy on the return to Queens Plaza. If you’re planning on attending and photographing the trains, I’d recommend bringing along a bright lens (f2.8 or better) and shooting at a fairly high ISO speed. 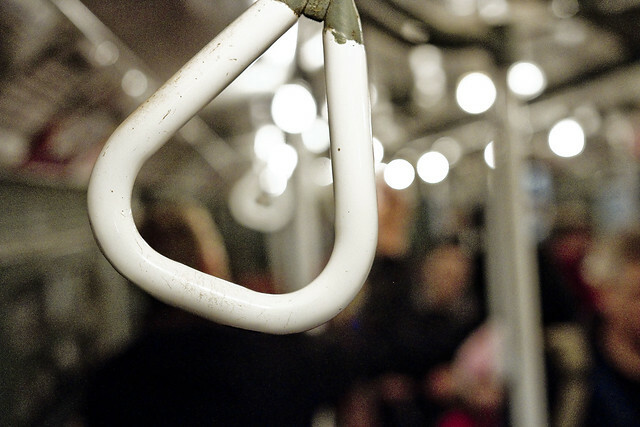 Modern subways are quite a bit better lit than these survivors. The shot above, if you’re curious – was captured at f3.5, ISO 4000, and a shutter speed of 1/250th. It’s also pretty important, when shooting in the “system,” to adjust your color temperature settings. If you’re on AWB or “auto white balance,” you’re going to be losing a whole lot of the image to an orange cast which will increase image noise. I shoot in raw format, and therefore always adjust the color temperature of the shot during the development process, but these were captured under the menu settings for tungsten light and later adjusted to 3750K. Thanking the merciful creator that I didn’t have to spend much time in Manhattan, the Nostalgia trains soon reentered Queens Plaza, where riders were commanded to debark by the MTA personell. It seems they didn’t want us to see the turnaround track, for some reason. Funny thing is, the crowd who was in attendance at this event seemed to be at least 50% railfan. Railfans will tell you the kind – and exact model – of the screws used to hold the track in place, when it was installed, and where the rails were forged. The train disappeared into the east bound tunnel, whereupon it executed a reversal along the occluded turnaround track, and then picked up another load of lookie loos for the journey back to Second Avenue. The Nostalgia trains are running every Sunday until the end of the year.